By Sue Chan - New Zealand - 23 Jun/03 - Viewed 1827 times. On our way from Greymouth to Franz Josef we passed through the historic gold towns of Hokitika and Ross and also travelled along the shores of three lakes � Ianthe � Wahapo � and Mapourika (the largest) arriving at the Glacier Gateway Motor Lodge, the closest motel to any Glacier in New Zealand, by 4pm. Our room had good views of the mountains and we soon left to take a closer look the Glacier. 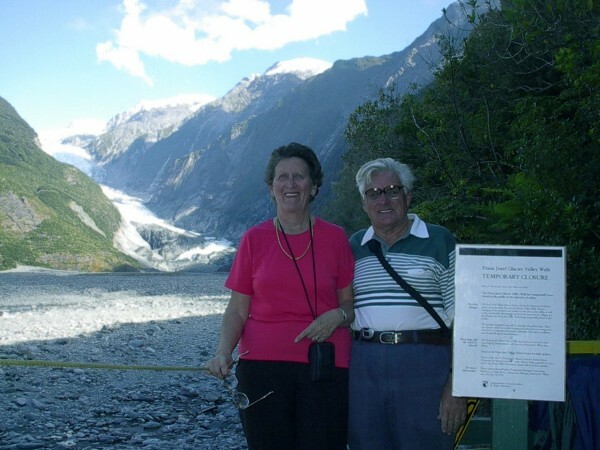 Franz Josef and Fox Glaciers are the main features of Westland National Park on the West Coast of New Zealand. Both are unique in that they descend as low as 300m in temperate zones. From the car park at the end of the Glacier Access Road we set out on the 45min walk to the ice face. Unfortunately about half way through the walk we came to a sign advising us the valley walk was closed due to icefalls and the changing course of the river so we retraced our steps and took another track to Sentinal Rock, a 10min climb. The Glacier has receded almost 2km from the rock since 1985. There were good views of from both vantage points and we stayed in the area for about 2 hours after which we went into the township where we stocked up on groceries and visited the gift shop and information centre. Next morning the mountains were covered in mist so we were pleased we had walked the night before and we did not hurry to leave the Motel. Twenty-two kilometres further along SH6 we came to Fox Glacier Township were we left the highway and drove 7km into Lake Matheson. It is from here that on a clear day great views of Mt Cook reflected in the lake are obtained. We decided to do the entire circuit of the lake to allow time for the mist to lift. The forest was very thick and moss covered and we saw amazing reflections in the still waters of the lake and although Mt Cook did not appear entirely it was a great walk. After a picnic lunch we headed toward Fox Glacier along the 5km Access Road. The mountains were now clear as we took the track toward the terminal face along the Cook River, which flows from the Glacier. Returning to the highway we turned into the road signposted Glacier View where from the car park there is a walk through the forest with a different view of the Glacier. We really enjoyed our visit to the Glaciers. Back on SH6 we passed through beautiful stands of Kahikatea, New Zealand�s tallest trees near Lake Paringa then stopped to admire the view at Knight�s Point. After crossing the longest single lane bridge in N.Z. -1.7km - we came to Haast (petrol 130.9!) where the highway turns inland to follow the Haast River into the Southern Alps. Although not the first to travel that way, in 1863 Julius von Haast led a party of four to the coast and named the pass after himself. A narrow track had been completed by 1876, but work did not begin on the road until the 1920s and it was not finally completed until 1965. Forty-five kilometres from Haast we came to Thunder Creek Falls, with a drop 28m which were only a 5min walk from the road. We soon reached the Gates of Haast where an iron bridge spans the Haast River. Here the river surges over huge boulders making an impressive sight. We continued on to Fantail Falls below Mt. Armstrong. In the riverbed near the falls were towers of smooth flat stones, which had obviously been made by passers by with others continuing the habit until the area in front of the falls was covered with small stone towers. Still following SH6 we drove 49km to Lake Wanaka and followed the shoreline until we reached The Neck where the road crosses to Lake Hawea. Glaciers in the Ice Age carved out these two lakes. Our room for the night at the Lake Hawea Motor Inn overlooked the Lake and after travelling 309km that afternoon, we reached there with still enough daylight to enjoy the view. After a walk up the very short main street at Lake Hawea we had a nice dinner in the restaurant at the Inn. Next morning we drove around Lake Hawea Township thinking there must have been more to it than we had found (but there wasn�t) before continuing on toward Wanaka. We soon came to Puzzling World with a theme of anything puzzling and puzzling eccentricity. The entrance ceiling is like a giant Kaleidoscope and the toilet wall has a Trompe L�Oeil of Roman Toilets. There is a three-dimensional maze with a 1.5 km long complex of passages � which we gave up on � and an Illusion Room where each room features a different illusion. On the caf� tables are puzzles of all types to test your skills while you relax. This is a really fascinating place and we spent two hours there. Lake Wanaka covers an area of 181 sq km. After looking around Wanaka township � where it was very busy � and spending some time on the Lake shore we followed Crown Range Road, a more direct route to Queenstown, instead of the tour route through old gold mining towns. We passed the almost deserted village of Cardrona where a fence was strung with bras � we think to support breast cancer research � and reached the top of the range at Mt Larkins where we had views over the valley as we marvelled at the similarities with Queenstown in Tasmania. The road down from the range was extremely steep and winding. At the bottom a short detour took us into Arrowtown. The Arrowtown River was famous as one of the richest sources of alluvial gold in the world in 1862 when it was discovered a short distance from the town. Now there are carefully preserved buildings on the tree-lined streets and many historic buildings in Buckingham Street have been converted into tourist shops. The old Bank of New Zealand, built in 1875, is now a museum and information centre. At a caf� we had a Kiwi Burger for lunch. With lamb and mint sauce this was very tasty. We then continued on to Queenstown where we arrived at Sherwood Manor Hotel in the suburb of Frankston just after 3pm. We had been allocated an upstairs room and decided to see if a ground floor room was available. After a check on the computer one was found in the same block. As we were unloading our cases the receptionist came running to say that room was not ready and if we would like to wait in reception she would see what she could do. We were upgraded to a studio with a view of Lake Wakatipu and the Remarkables mountain range!